Microsoft has announced a new Windows 10 feature called Sets. The news was mentioned in passing in a recent blog post about updates for Windows Insiders, with a focus on delivering the Timeline to Windows task view. However, an accompanying video explains the utility value of Sets and demonstrates it in use when working on a project between different computers. In your web browser you might have some default tabs load, or even be organised enough to save tab sets to recall when undertaking various tasks. The Microsoft Sets feature brings that style of work organisation to those whose productivity revolves around the use of its Office suite. 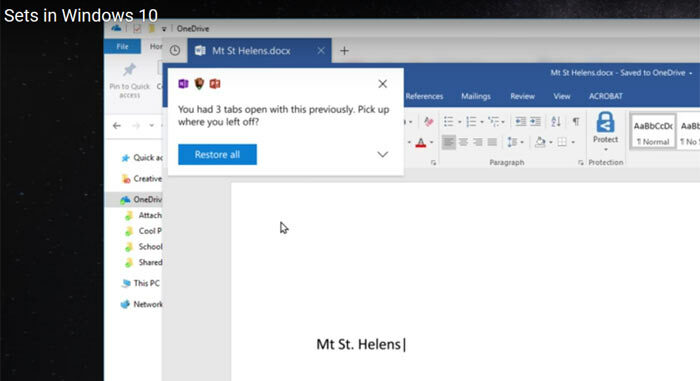 In the video above you can see the user starts a session in Word, as usual, just clicking on the icon pinned to the task bar in Windows 10 and starting a new document. So far, so simple. (Please note that the apps used in the example video aren't Microsoft's web apps appearing within Edge, they are the full desktop apps.) After the initial document setup the 'magic' begins, with a click on the new tab icon at the top of the window (with Timeline access on the top left of the window). Once you have opened a new tab you will find the 'recent destinations' icons which contain websites and Microsoft apps, scrolling down reveals recent documents, pinned documents, and documents that have been shared with/by the user - on OneDrive for example. The example 'Sets' project is a school report about Volcanoes. 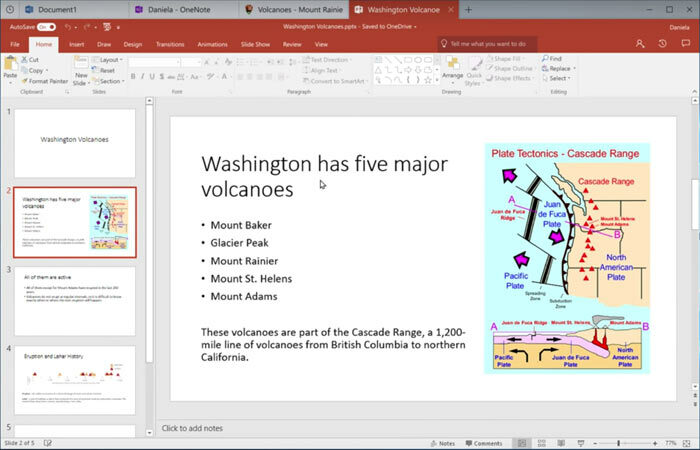 User tabs eventually build up to include the Word doc, a OneNote document with pictures, text and links, Powerpoint files, and web pages with reference material - all in the same window. Helpfully, a new tab window also includes a search facility which can find your own documents and online resources. After taking a break for dinner the student returns to find the computer she used being used by a relative. That's not a problem as she logs into another computer with her Microsoft (with Office 365) account. Launching the Word file saved in OneDrive, the user is prompted by Windows to keep on working on the project as it was tabbed on the other computer. A dialogue box asks "You had three tabs open with this previously. Pick up where you left off?" The above work doesn't rely upon you being an Office 365 subscriber, just a user of the latest version of Office. However, we are reminded that for those that do subscribe to Office 365, there are other nice tools to leverage within your reports, such as Microsoft Researcher. If you work solely within the above Microsoft Office ecosystem then Sets looks like a rather appealing development, which could be refined further. For me, I like to use Microsoft's OneDrive sometimes for document backup and working between different PCs but I am happy with my rather old version of Word, an even older copy of Adobe Photoshop, and the latest Firefox browser. I'm not sure how being able to restore research and related tabs along with a document is dumbing down? It's basically just an advanced autosave feature, and I doubt that you'd advocate removing autosave from Office, would you? Going back to the taskbar of old (where multiple documents open in word, for example, each had their own icon)? It's rumoured to only work in UWP stuff not proper applications.